You are viewing » Home » Issues » Heritage Issues » A Tram is a Tram is a Tram …? Call it a ‘light rail vehicle’, but it’s a still a tram; and after a 39-year absence, trams resumed passenger services to Glebe in 1997. The original tram service in Glebe was by way of rails laid along Glebe Point Rd from Broadway to the terminus immediately adjacent to Leichhardt St.
Green and cream tramcars with hard, wooden seats, colour-coded destination signs and sparking trolley poles, all driven and ‘conducted’ by uniformed staff, were a familiar part of the suburb’s scene until November 1958. The re-introduction of a tram service to Glebe in August 1997 was a little different; this time the tramcars were called ‘light rail vehicles’ and they ran at least 15 metres BELOW Glebe Point Rd in a tunnel that was once a part of the abandoned Metropolitan Goods Line from Redfern to Dulwich Hill. Seven German-designed ‘Variotrams’ provided this ‘subterranean’ service until 2014 when they were replaced by the Spanish-built Urbos cars when the light rail system was further extended to Dulwich Hill. So, after a life of no more than 18 years, the last of the Variotrams, No. 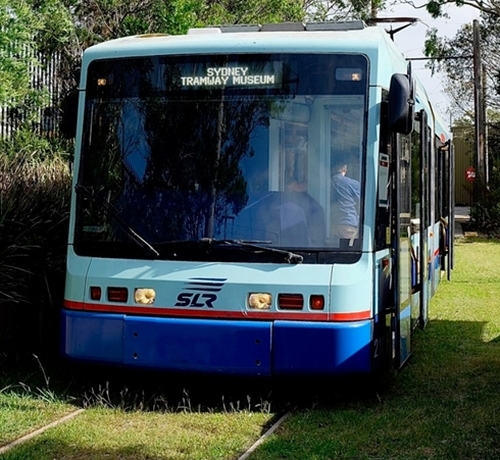 2107 has gone into retirement at the Sydney Tramway Museum at Loftus. And here it is, on its first day of display to the public, 24 February 2019, to commemorate the end of Sydney’s first tramway network 58 years ago.